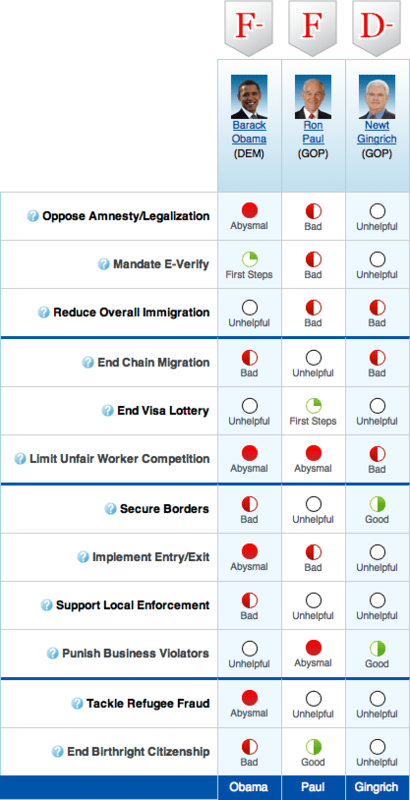 On the 12 most important immigration categories, Ron Paul’s ratings add up to an overall stance that just barely misses warranting an F-minus, which is the grade for Obama. Paul’s F is significantly worse than the grade of former Speaker Gingrich who had previously been the worst of all Republican 2012 presidential hopefuls on immigration. Click here to read all citations and analysis behind each of the 12 ratings for Paul. Also, here is where you get information about how to contact Congressman Paul about his immigration positions. This entry was posted in 2012 Election, crime, Culture War, Republican Party, Taxes, US Presidents and tagged Illegal immigration, Newt Gingrich, Obama. Bookmark the permalink. Ron Paul gets F’s straight across the board in my book.